Description: NO MAGAZINE SALES into NEW YORK CITY. CONNECTICUT residents must furnish us a copy of your CT Eligibility Permit or ammunition certificate. This listing is for ONE magazine. Here are extra or replacement magazines for the most reliable, most accurate .22 pistols in the world, the Ruger Mark II series. These will not, however, fit the older Mark I or later Mark III pistols. They will only fit steel frame Mark II Rugers; won’t fit Mark I, won’t fit 22/45, won’t fit the cigarette lighter plug of a 1953 Nash Metropolitan Convertible. 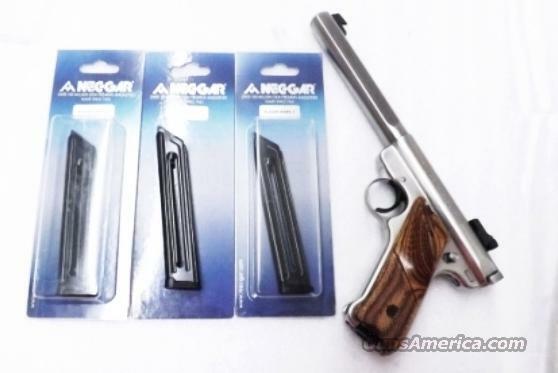 These are for the majority of Ruger pistols in existence today, because the Mark IIs were manufactured from 1982 until 2005. Manufacturer is Mec-Gar SRL of Gardone, Italy. Construction is steel body, spring, and spring guide, with polymer cartridge follower and floorplate. Each magazine holds 10 rounds of .22 Long Rifle caliber ammunition. All these are brand new in their original factory packaging, blue steel 10 round with factory Mec-Gar logo on their floorplates. These will only fit MKII Pistols manufactured from 1982 until 2005. We're offering these fine magazines for only	$ 26.00. Not for sale to residents of New York City. Any magazine deliveries into New York City require written permission from the Police Commissioner, so we cannot ship magazines into any of the six boroughs or 176 some odd zip codes, per NYC Code 10-131.10.